Taking account of the increasing popularity of Eastern Metropolitan (EM) Bypass in Kolkata, 99acres.com scans the infrastructure growth and realty prospects along the stretch. The Eastern Metropolitan (EM) Bypass is a 29 km-long stretch that connects Bidhannagar in the north-east to Rajpur Sonarpur in the south-east of Kolkata. The stretch was constructed to reduce the perennial traffic on the Gariahat Road. However, with improved infrastructure, and commercial establishments alongside, it has evolved as a coveted destination with residential developments from trusted builders and developers. The area is also replete with educational institutes, health care centers, entertainment options, and shopping arcades. The Bypass runs through some of the prominent localities of Kolkata such as Maniktala, Park Circus Area, Gariahat, Selimpur, Lake Garden, Garia, and Jadavpur, and unfurls a host of residential opportunities. From swanky villas to sprawling housing societies, the belt is peppered by numerous options. On an average, capital ‘asks’ along EM Bypass tend to vary from North to South. With most of the premium projects located in the North, average capital 'asks' vary between Rs 6,000 per sq ft and Rs 7,000 per sq ft. On the contrary, the South of EM Bypass is replete with several affordable housing units with average capital values hovering between Rs 3,100 per sq ft and Rs 4,000 per sq ft. Rental values also follow a similar trend and are pegged higher in the North of EM Bypass than the South. While a 2 BHK unit in the North is available at Rs 18,000-20,000 per month, in the South, a similar 2 BHK apartment is pegged at Rs 8,000-10,000 per month. 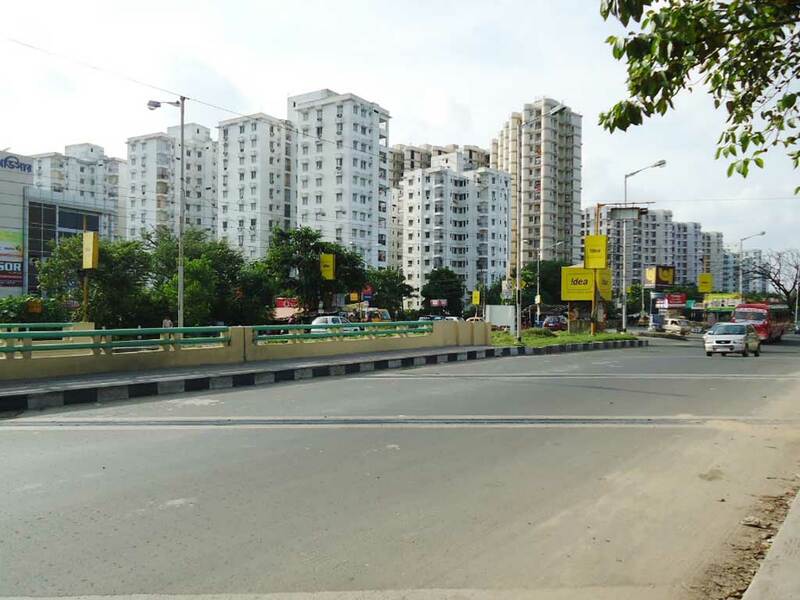 EM Bypass offers smooth connectivity to multiple micro-markets in the city via different connectors, for instance Maniktala leads to Maniktala Market, Beleghata connects to Sealdah Railway Station, Park Circus links to Park Circus, JBS Haldane Avenue, Science City and Howrah, Rash Behari connects to Gariahat, Kalighat, Deshapriya Park, Kasba, Chetla, Alipur, and Ultadanga that leads to the airport. Additionally, the area is also self-sufficient with various malls, hotels and health care centres. The reputed ones include Metropolis mall and Mani Square mall, ITC Sonar hotel, Hyatt Regency, Fortis Hospital, Kothari Medical Center and Nightingale Hospital. Improved connectivity and sound infrastructure have opened gateways for numerous software companies such as Maxsurge Technologies (P) Ltd, Halder Communication, Cimmco, Sun Dew Solutions Pvt Ltd, and Dream High Tech. Besides there are several public sector offices in Bidhannagar such as Post Office, Indian Patent Office, Syndicate Bank, Bidhan Nagar Poura Nigam Borough Office that adds to the bypass’s popularity. The stretch acts a high-speed link between the affordable localities mentioned above, and the public and private sector undertakings, therefore, most of the locals employed in nearby offices prefer to reside here. Metro project- A 29 km-long metro corridor running between Garia and Netaji Subhash Chandra Bose International Airport via EM Bypass, Salt Lake and Rajarhat is under construction and is expected to be commissioned by June 2019. Bus Rapid Transit System (BRTS): A BRTS has been planned under the Kolkata Metropolitan Development Authority (KMDA). Starting at Ultadanga, it will cover 15.5 km route from EM Bypass to Garia. The corridor will run through some of the noted growth centres like Ultadanga, Salt Lake and Patuli Township. Currently, the project is under construction and is expected to be completed by 2018, year-end. Overall, flourishing IT/ITeS sector, congestion-free roads, reduced commute time, an abundance of housing options and affordable property values, cumulatively, bode well for substantial realty growth along the EM Bypass in Kolkata. From an investor’s standpoint, property values are expected to see close to 15-20 spike annually. Completion of infrastructure projects will also have a significant bearing on the overall growth. Not only capital but rental values, too, are expected to witness an upswing, making EM Bypass an investment hub with high potential to yield healthy ROI.